Ford Focus 2007 14F Rear Wiper Blade Bowes WB20914. Our BOWES branded durable high quality wiper blades emulates OEM (Original Equipment Manufacturer) design. 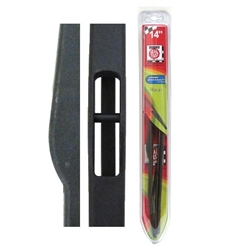 It’s an exact fit rear wiper blade designed for your specific application. Our rear wiper blades utilize a patented silicone rubber blade with graphite and PTFE that ensures smooth operation, superior visibility, and outstanding performance that can last for years, not months.